This is the throwing knife that all professional and tournament throwers have been asking for. John Bailey's Zeil throwing knife is perfectly balanced for both handle and blade throwing, delivering maximum penetration in all types of competition targets. This is the best "tournament grade" production throwing knife made in decades. The Zeil knife is made of super tough 1/4 thick 420J2 stainless steel and has an overall length of 13 1/4" and weight of 14 oz., which meets or exceeds all the requirements of most knife throwing clubs. Includes a genuine leather sheath with tie. i bought one of these without having an account. none the less i loved it. very nice balance. quality sheath. and the leather strap at the bottom of the sheath made it much more comfortable to use and added stability when drawn. very pleased with this item. p.s. 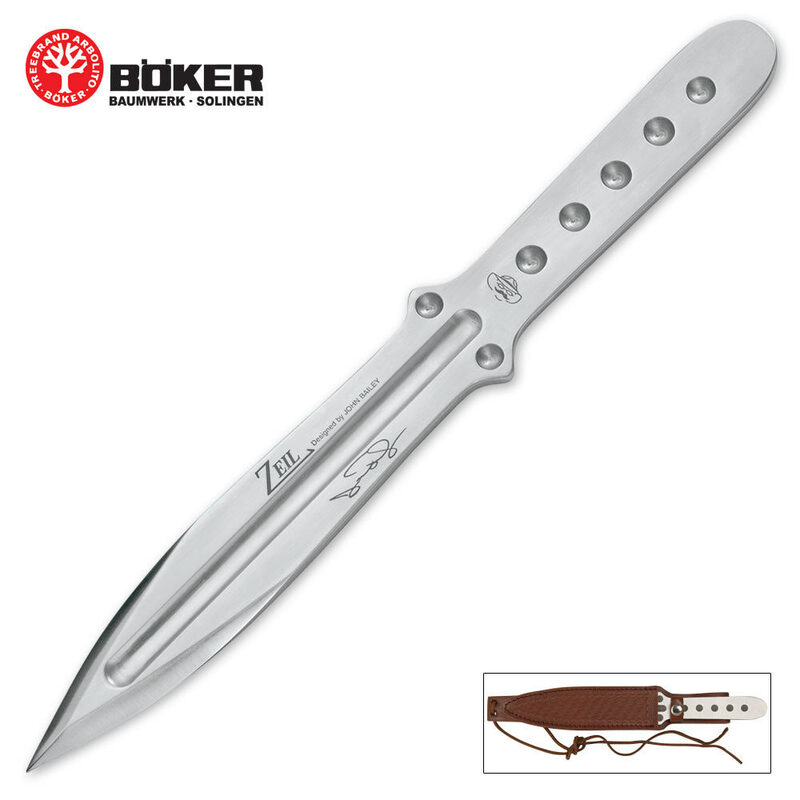 i recently saw a throwing knife shieth on expendables three that id love to have for myself. it was shoulder shieth that held multiple knives. if you decide to start selling them at some point. id most likely be one of the first one to buy one. I bought this thinking that it was a one of those small sized throwing knives. What I didn't realize was that this blade is HUGE! It's almost intimidating. I held it in my hand and i felt like i was holding a dagger version of Roman Sword. The Design, the Balance point, it's very amazing. I think I'm going to like this accidental Purchase. Great buy!! got two & me & kids put thru good use. natural throwers for all,( 9yr daughter @ 60%!!) easy to clean & maintain & stainless great for our mountain climate. Leather sheath kinda cheap, heavy nylon reinforced w plastic would be much better choice. Love steel & design, natural thrower, buying more & having custom multi-blade sheath built. definitely worth getting extra blades & accessories. No toy, must have good target & backdrop. This thing real & works, even small game getter. now part of my permanent gear. great deal TS passes on 2 customers again. This is the best thrower I have ever got my hands on! I got this from Bro. John Bailey Himself(I traded Him for My Spartan Sword) when He came to do a show at My church(He's a great Preacher too!) It sticks great every time it hits at the right angle(when it hits with the tip and not the handle) I personally threw this threw a flat box,three strips of sheet metal and stuck it into a water heater all at once! It did bend the tip but,I bent it back. After you bend the tip once it gets easier to bend it the next time you throw it but, after some filing it won't bend as easy. But,All in all,This knife is the best thing I have ever thrown! Great throwing knife for the hard or medium thrower. The point seems sturdy and the blade is not sharp so you won't cut yourself with a blade throw. Right out of the box I was sticking it 90% of the time from 16 feet. Flies true and feels good. I feel as if I'm throwing an ax when I throw it which I seem to throw better anyway. I would compare it to the hibben tournament throwers or the cold steel true thrower. Ok this is an update. First of all thank you to all the guys and gals at trueswords .com for their excellent service. I had a problem with the very first one i got, but thanks to them it was fixed within the week. second this knife is freakin amazing. it has quickly became my favorite throwing knife of all time. Completely worth every penney! great for seasoned throwing or budding novice alike. This is great! I practice the Thorn (no-spin) style of knife throwing and it's tough to find good knives that are big enough. This one definately fits the bill: it's extra long, with a very thick blade, and only has an edge on the very tip. Throwing knives tend to be too thin and too sharp. This one is perfect!